Ubuntu 13.04 comes with the usual bug fixes and performance improvements. That given, I look at what is really, really new in Raring Ringtail. Not mentioning the performance enhancements would be unfair. Unity seems to be a much more stable environment, and everything, HUD included, works as expected and is much faster. The desktop in general definitely feels snappier and more solid. The new icon set in the launcher, without going so far as being "a thing of beauty," is nicer than that of previous releases. The system icons are prettier, and the background is the same for all of them. Gone are the garish Ludo-like colors used for LibreOffice applications and other non-native applications on prior releases. All buttons sport the same semi-transparent background. Now, if they could just get rid of that default livery-purple wallpaper. Apart from the improved appearance, the Launcher now boasts contextual menus. Right-clicking on an icon brings up a menu that allows you to access some of the application's functionality even before you run it. If you right-click on the Dash icon, for example, you can choose in which area you want to search (e.g., applications, files and folders, music) before launching the HUD. If you right-click on the Files icon, it offers to open the filesystem browser, pointing to a directory from your bookmarks (Figure 1), and if you right-click on the LibreOffice Writer icon, it offers to open a new document … although it already does that if you just click on it, so that was pointless. 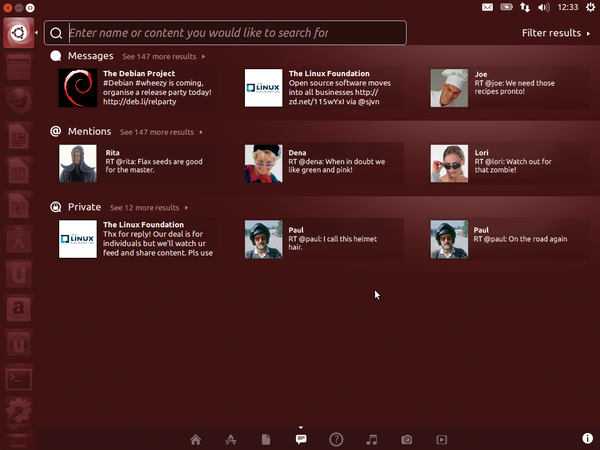 Figure 1: With the Launcher's contextual menus, you can access application options before launching the program. Launcher buttons also show little notches on the left side that indicate how many windows of the same kind you have open. Speaking of which, a new gesture-based window-switching system makes it easy to flip through all the windows of the same kind (i.e., all open LibreOffice Writer documents, all filesystem browser windows, etc.). The idea is to hover over the appropriate icon in the Launcher and scroll your mouse wheel to cycle through the windows. A demonstration of this feature  shows how well it works. Moving on to the desktop proper, another nice detail is window-snapping. When you drag a window to the left or right edge of the screen, a translucent yellow shadow occupying half the screen appears. If you then let it go, the application window grows to occupy exactly half of the desktop space (Figure 2). Figure 2: Window-snapping allows you to maximize your desktop real estate when working with more than one application. This feature is very useful if you want to maximize window real estate but need to see the contents of two applications open at the same time, side by side. You will notice that only one workspace is active by default. If you're used to having more, you can go to System Settings | Appearance and mark the Enable workspaces checkbox in the Behavior tab. 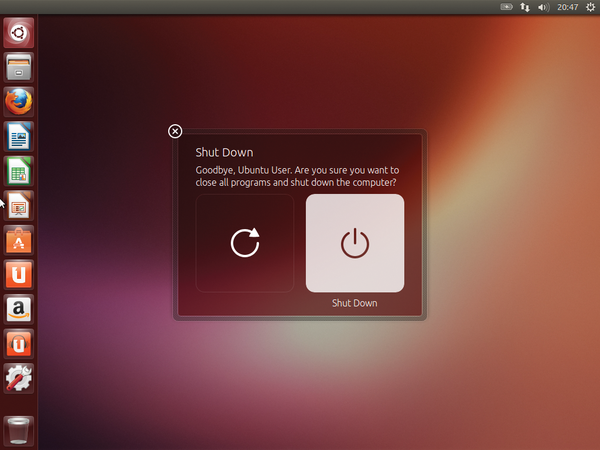 Last, but not least, are the Logout and Shutdown dialogs (Figure 3). These have been revamped and now show large, friendly buttons on a semi-transparent background, making it really hard to miss the option you want. Figure 3: Big, friendly buttons make it difficult to mess up when closing down, rebooting, locking, or logging out of your system. 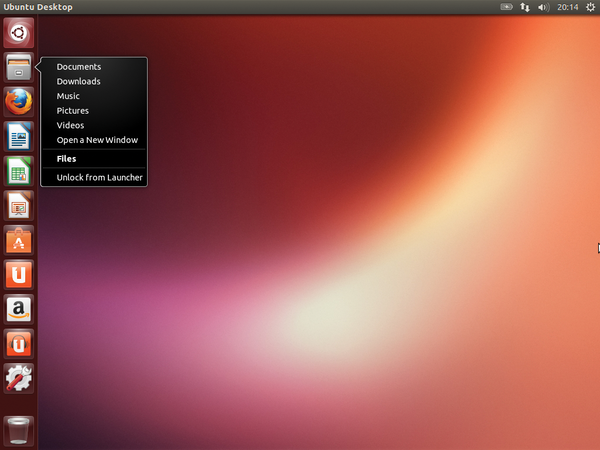 Ubuntu 13.04 comes with the latest version of applications we have come to expect from a modern distro. 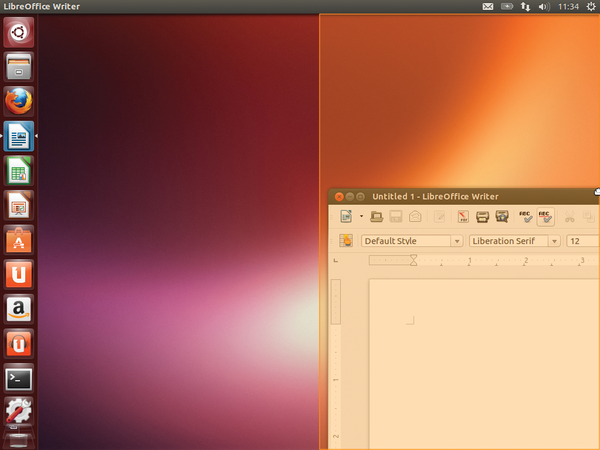 LibreOffice 4.0 (the latest) is preinstalled, and version 20 of Firefox has been modified with Ubuntu-specific settings that give it Apt support, meaning you can install software directly from within Firefox using the apt:// protocol. As for your social life, Gwibber has been dropped as the default app for interacting with your online contacts. Although it is still available from the Software Center, the idea is that you will use the new Friends Lens (Figure 4). Figure 4: The Friends lens integrates your social life within the Dash interface. The Friends lens apparently integrates Twitter, Facebook, Google+, and all your other online social programs into an interface integrated with Dash. That's the theory at least. The fact is that I had to install the Friends lens and Gwibber before it actually showed up on the dashboard. Apart from that, there seems to be very little else preinstalled in the way of applications. Granted, given the 800MB or so default ISO image, it cannot contain the same amount of software as the 4GB+ behemoths distributed by other distros (although our cover DVD is another story altogether), and we don't want Ubuntu to go the way of Windows and preload tons of crapware that you then would have to remove to get a half-usable system; however, it is still a bit surprising how sparse the default Ubuntu 13.04 is and how some all-time favorites, such as the GIMP graphics program, are missing. Be comforted knowing that a whole multiverse of software is just a few clicks away in the Software Center. If you're new to Ubuntu, you can learn how to install new software in the Discovery Guide on page 88.